You’ve heard the hype that California’s Los Angeles Freeway 405 closing will cause “Carmageddon” – gigantic gridlock this weekend. What’s wrong with this prediction? If gigantic gridlock occurs – they were clever. If no gridlock occurs – their efforts to get people to do alternate transportation worked. Thats extremely misleading because I predict – traffic will decline ! 2. 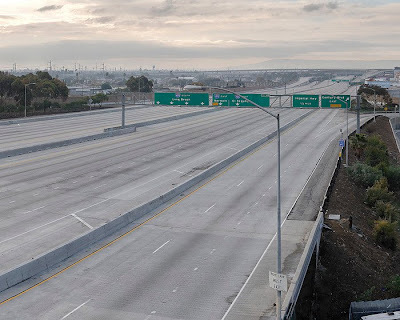 Over and over again when freeways are closed – traffic declines !!! Yes this sounds Counter-intuitive – but its a real phenomena. Update Saturday Morning (July 16, 2011) — Traffic is fine so far – just as predicted here. “Carmaggedon? More like carmaheaven. No traffic in L.A.,” tweeted Chip Dorsh, who said he breezed through a canyon road to get from his job in Culver City to the San Fernando Valley. This entry was posted in Bureaucratic Fraud, Understanding and tagged Central Freeway, Chip Dorsh, Harbor Drive. Bookmark the permalink.